Public Sharing now available for Dump Truck Online Storage! 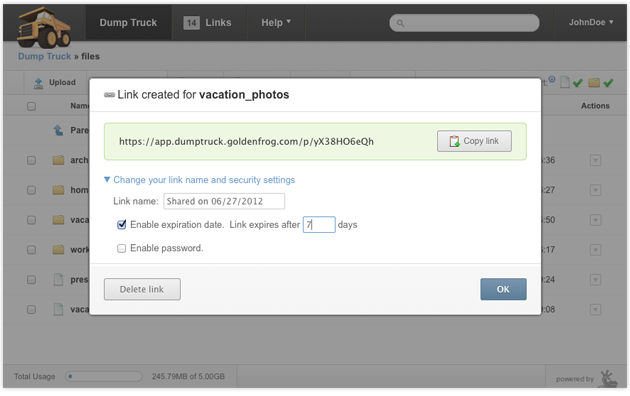 Today, the Golden Frog development team added public sharing to Dump Truck online storage! As a Giganews member, you can create public links to securely share your photos, videos, documents or even entire folders with your friends and family. Public sharing is the most requested Dump Truck feature and we are excited to deliver public sharing to Giganews members. From the beginning, Golden Frog has made security a key focus during Dump Truck development. 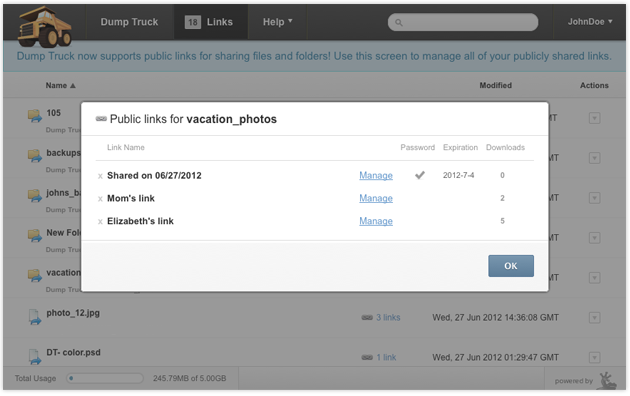 To provide more security and control, you can optionally secure public links using passwords and link expiration dates. You can also create multiple links per file/folder and track the number of downloads per public link in the Dump Truck web app. You can turn off one link while keeping other links active! Dump Truck is included FREE with every Giganews membership. We invite anyone who wants to try Dump Truck to sign up for a 14 Day Free Trial of Giganews. Diamond members receive 30GB included free, while all other accounts include 5GB free. Giganews members can login to Dump Truck and start sharing today! Please subscribe to our blog, and follow us on Giganews Facebook, Giganews Twitter, or Giganews Google+ to stay up to date on Dump Truck online storage.